A mountain bike glides over a narrow single track, and nothing remains on either side except a steep drop hundreds of meters deep. Above the sky is wide and bright. There’s no doubt Harald Philipp has ridden on some of the most beautiful mountains out there. In order to reach them, he often carries his bike thousands of meters uphill. “BikeMountaineering” is what he calls his sport and his eyes are glowing with excitement when he talks about it. During our interview, Harald told us all about his passion – and why the one thing he always brings is a little espresso maker. Hey Harald, you are into BikeMountaineering. What exactly is that? BikeMountaineering is the line between alpinism and bicycling. 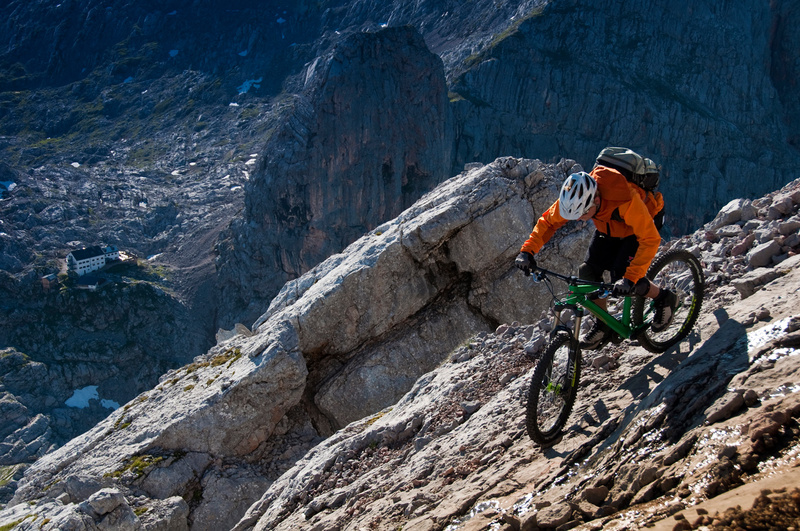 It’s all about riding summits and steep alpine tracks, at least for the downhill. Uphill, we usually carry our bikes. What’s the difference to normal mountain biking? Carrying your bike up a mountain is the difference that’s most visible. But there’s a whole different philosophy behind it. Most cycling sports are all about racing, we don’t have that aspect at all. BikeMountaineering is an adventure that you share with your friends. What’s the best thing about BikeMountaineering? The anticipation, the summit or the ride downhill? All of it! It starts while I am planning the Tour. It takes time to come up with and prepare such a project in the mountains – and with it comes excitement and anticipation. The ascent is beautiful too, we get all the good parts of hiking here, but skip the annoying walk down. And finally, the descent is the real kicker. Would you say you invented BikeMountaineering? How did you start it? No, I didn’t invent it. Taking your bike up into the mountains is an idea that has existed longer than I have. For me, it was Picco, a mountaineer and cycling pioneer from Innsbruck, and his friends who took me on my first alpine tour. After that I was hooked and started doing tours on my own. Carrying an unwieldy, heavy piece of equipment with two big wheels up a mountain – that doesn’t look too comfortable. Do you have a secret technique? Luckily, modern bikes are made of aluminum or carbon fiber, which makes it much easier. Carry your bike with the lower frame parallel to your shoulders, that makes it bearable and after a while you get used to it. The trails in your videos look heavenly. How do you find such beautiful tracks and summits? I spend lots of time bent over hiking maps. The most beautiful place you’ve been to with your bike? Brenta. It’s always the Brenta Dolomites. Let’s talk equipment: What do you always bring on a mountain? My Bialetti espresso maker. I even have a special bottle holder for the thing. Favorite snack on a mountain? Sea of Rock and Into Thin Air are two beautiful, well-known mountain bike films of yours. Is there going to be another one soon? Yes, our Iceland film will be online next week. It’s not only about BikeMountaineering though, rather about a special adventure of another kind. 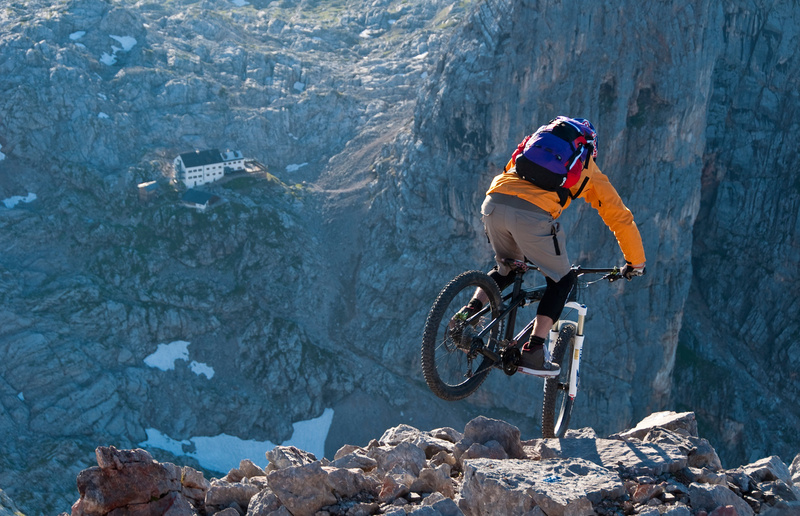 What’s your advice for mountain bikers who would like to start BikeMountaineering? The trail usually doesn’t start where the gravel road ends, but a bit higher up. Carrying and shifting your rear wheel are key at this point. And where are you going next?